Eagles defensive end Chris Long (56) is up for the NFL's Man of the Year award. ATLANTA — Chris Long is a good locker-room guy. Heck, he’s one of only 32 players up for the NFL’s Man of the Year Award. But the defensive end doesn’t want to return to the Eagles or any other team if he’s filling out a roster primarily because he sets a good example for teammates. Should these Eagles stay or go? Long has been a good football player for 11 seasons, but this season was probably his best in five years — even at age 33. Health and scheme were factors, compared to some of his more recent seasons, but playing more snaps contributed to his increased production. The more Long played, the better he got. But the NFL isn’t always a meritocracy, especially for aging players. And while he’s under contract with the Eagles for next season, nothing is guaranteed. Long has been ubiquitous at the Super Bowl this week. As part of his duties as a Walter Payton Man of the Year nominee, he’s been making promotional spots along the media circuit. Most are planned, but even in the middle of a tight schedule Friday morning, Long stopped for a physically disabled reporter and answered several questions. The league, in previous years, would narrow its Man of the Year nominees to three for Saturday’s NFL Honors event. But all 32 players this year will be present when the winner is announced. Long, who has given countless hours, energy and even his own money to causes funded by his Foundation, also was nominated by the Rams just three years ago. He didn’t win then, and might not win now, but he’s been using his nomination as a platform. Nationwide has already donated $50,000 to his Foundation, and if he wins, it’ll be another $250,000. 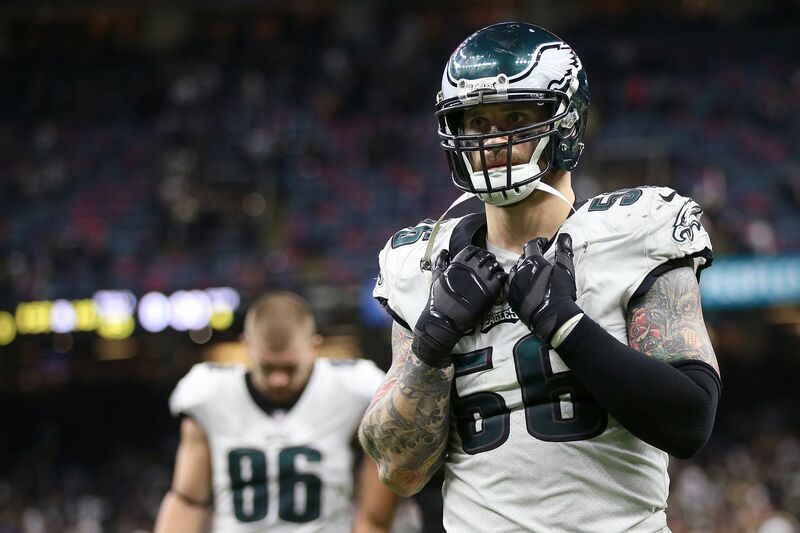 Eagles defensive end Chris Long (56) sacking Texans quarterback Deshaun Watson (4) and forcing a fumble during a December matchup. Long has used his success on the field to advance initiatives such as clean water and children’s literacy. Winning Super Bowls the previous two seasons, after missing the playoffs in his first eight years, also helped raise his profile. This season was different because, for the first time in his career, he lost in the postseason. He had a hard time talking about his future two weeks ago, but retirement doesn’t sound like a choice he’d make on his own. The right situation would allow Long to play a certain number of snaps. He felt the same way last offseason, and the Eagles extended his contract two years, although there weren’t any guarantees. But Long did play more than he did in 2017, even before starting defensive end Derek Barnett suffered a season-ending shoulder injury. Barnett is likely the only Eagles defensive end who definitely will be back next season. Brandon Graham is a free agent. Michael Bennett is under contract, but he’s also 33. Rookie Josh Sweat’s future after he suffered a season-ending foot injury is unknown. The draft could provide another commodity. But the defensive line was arguably the Eagles’ most productive unit this season, and Bennett (nine sacks, 30 quarterback hits), Long (6 1/2 sacks, 20 hits), and Graham (four sacks, 11 hits) put up good numbers and even better film. Graham could be a lost cause once he hits the market. But Bennett ($7 million) and Long ($5.6 million) have reasonable salary-cap numbers considering their production. Long also hasn’t missed a game in two seasons, and he’s also, yes, a locker-room leader. Next month, Long will make his third climb up Mount Kilimanjaro to raise funding for wells in impoverished areas throughout the world. Last year, former Eagles defensive end Connor Barwin went along on the expedition. This year, Long has recruited Eagles defensive tackle Haloti Ngata, and he recently got Eagles center Jason Kelce and former Eagles defensive tackle Beau Allen to commit. Long wasn’t taking sides in Sunday’s Super Bowl matchup between his former teams, the Los Angeles Rams and Patriots. Only if the Rams were still in St. Louis, Long said, would he have supported one team.